What are some ways that you could get MRSA? How do I stop MRSA from spreading when I have an active infection? Can I get a staph or MRSA infection at my health club? You don’t follow directions when taking antibiotics. It is important to take all of the doses of your antibiotic even if the infection is getting better. The last few pills kill the toughest germs. Tell your doctor if your infection does not get better in a few days or if you begin to feel worse. Do not poke or squeeze the sores. Do not touch sores, especially ones that cannot be covered with a bandage or clothing, such as sores on your face. If you do touch a sore, wash your hands immediately. Cover any infected sores with a bandage. Wash your hands immediately after putting on the bandage. If you have a leaking sore, put extra dressings over it to keep the drainage from leaking through. Be careful not to get any pus or body fluids on surfaces or other people. Wear clothes that cover your bandages and sores, if possible. Be especially careful if you are around people who have weak immune systems, such as newborn babies, the elderly, or anyone with a chronic disease. If they get MRSA, it can make them very ill.
Be careful if you are around someone who has a skin condition, such as eczema, or someone who just had surgery. They may be more likely to get an infection. Do not participate in contact sports until your sores have healed (sweating can cause a bandage to loosen and lead to contact with equipment and other people). Do not go to a public gym, sauna, hot tub or pool until sores have healed. Do not get manicures, massages or hair cuts until sores have healed. If you have an active MRSA infection on your skin, it is contagious. If someone touches your infections, or touches something that came in contact with your infections (like a towel), that person could get MRSA. If you are a MRSA carrier, you still have the bacteria on your skin and in your nose. If you don’t wash your hands properly, things that you use or touch with your hands can give the bacteria to other people. MRSA can also be found in the liquid that comes out of your nose or mouth when you cough or sneeze. In the outbreaks of MRSA, the environment has not played a significant role in the transmission of MRSA. MRSA is transmitted most frequently by direct skin-to-skin contact. You can protect yourself from infections by practicing good hygiene (e.g., keeping your hands clean by washing with soap and water or using an alcohol-based hand rub and showering after working out); covering any open skin area such as abrasions or cuts with a clean dry bandage; avoiding sharing personal items such as towels or razors; using a barrier (e.g., clothing or a towel) between your skin and shared equipment; and wiping surfaces of equipment before and after use. Staph infection causing a pus-filled boil. Staph infection causing an open sore. 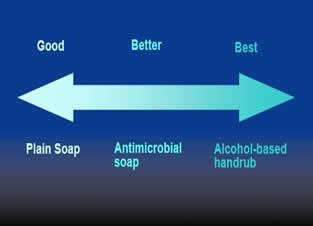 Plain soap is good at reducing bacterial counts but antimicrobial soap is better, and alcohol-based handrubs are the best. 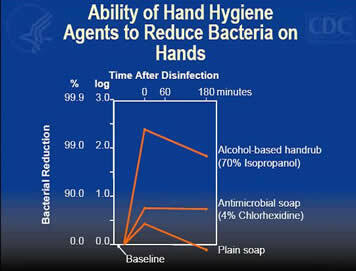 This graph shows that alcohol-based handrub is better than handwashing at killing bacteria. Shown across the top of this graph is the amount of time after disinfection with the hand hygiene agent. The left axis shows the percent reduction in bacterial counts. The three lines represent alcohol-based handrub, antimicrobial soap, and plain soap.